The Coen brothers deservedly applauded re-make of the much-loved John Wayne classic. A tough, US Marshal helps a stubborn young girl track down her father's killer. Based on Charles Portis' novel, old and new Hollywood stars delight in the return of a greatly missed genre - yee-ha! An award winning, modern tragedy based on recent real events. A group of Catholic monks, living peacefully in an impoverished Algerian community must decide whether to leave or stay as the threat from Muslim fundamentalists deepens. Quirky, low budget British indie film. A firm of 'exorcists' run by The Colonel removes skeletons from people's cupboards, unearthing embarrassing secrets along the way! A film of fresh, internal logic - both eccentric and amusing! When a young, devoted but jobless cellist answers a classified ad entitled 'Departures', he unexpectedly finds himself perfecting the art of 'Nokanshi'- preparing the deceased for their journey into death. A light-hearted yet poignant view of Japanese culture. A determined young Ozark mountain girl fights through dangerous terrain as she hunts down her drug-dealing father so that she can keep the rest of her family together. 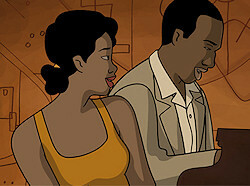 A beautifully crafted animation set to an amazing soundtrack of Jazz greats! This is an entertaining and refreshing take on an old-fashioned, musical romance. Join us for live Jazz before the film. Guest tickets for this film cost Â£8. Ticket price includes a complementary cocktail and live jazz before the film. Jim Loach (son of reel people friend and fan, Ken) makes his directorial debut. British social worker, Margaret Humphreys, becomes determined to uncover the truth about the post-war deportation of hundreds of children in care, from the UK to Australia. Tommaso, the youngest son of the Cantone eccentric pasta-making dynasty decides to reveal a personal secret to his family but his older brother unexpectedly ruins his plans. A sharp, tightly scripted comedy. Director Mike Leigh at his best, tells a story of gentle ageing. Happy couple (Jim Broadbent and Lesley Manville) support their less happy family and friends through the unfolding seasons of a 'typical' year. Semi-illiterate, fifty-something Germain (Gerard Depardieu) finds comfort in life's little things. When he meets Margueritte (Gisele Casadesus), he gains a fresh perspective through her wit, wisdom and zest for life and literature. Sir Lawrence Olivier is making a movie of 'The Prince and the Showgirl' in London. Young Colin Clark, an eager film student, wants to be involved and he wangles himself a job on the set. 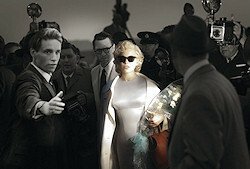 When film star Marilyn Monroe arrives for the start of shooting, all of London is excited to see the blonde bombshell. While Olivier is struggling to meet her demands and acting ineptness, Colin is intrigued by her. Marilyn invites Colin into her inner world where she struggles with her fame, her beauty and her desire to be a great actress.